MELVILLE, N.Y., January 7, 2019 – Canon U.S.A., Inc., a leader in digital imaging solutions, today announces its official partnership with remote camera-platform company Brizi, the creators behind BriziCam. 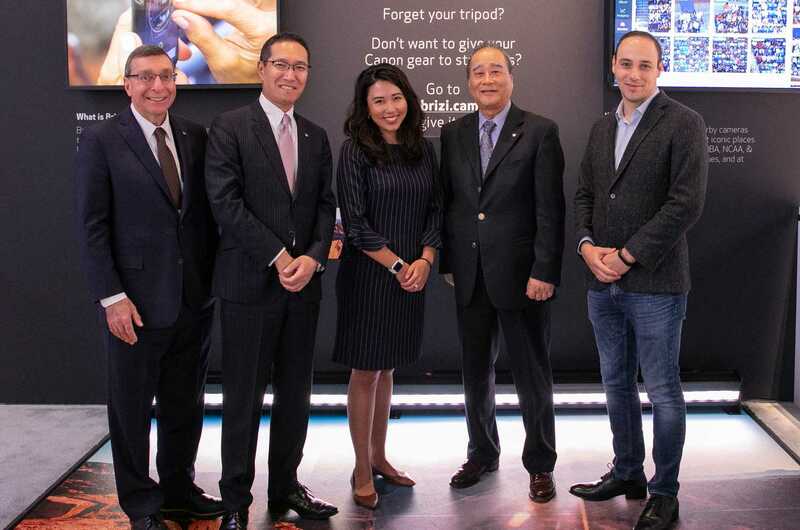 The partnership will assist both Brizi and Canon to further immerse themselves into new markets and continue to innovate in the imaging space. Elements of the partnership will include sales, joint marketing and a research and development (R&D) collaboration. Canon is already Brizi’s top imaging-equipment provider, with the platform taking advantage of Canon EOS digital cameras, the Canon software developer kit (SDK) and its application program interface (API). This platform helps users tap into nearby cameras to capture group memories across the NBA, NCAA, European football, Grand Slam tennis, and at iconic cultural landmarks such as at the Washington Monument. To date, shared “Brizi Moments” have reached more than 26 million people across 7 countries. Brizi and Canon will aim to set a new standard for group-memory experiences on both a national and global scale. Prior to partnering with Canon, Brizi uncovered a void in the marketplace – a challenge in capturing group photos at iconic places. With the help of professional-grade Canon cameras and lenses, enabled with Canon’s SDK and API, Brizi has reinvented the group photo experience. Last year, Brizi showcased its use-case in sports & entertainment in the Canon booth at the 2018 Consumer Electronics Show. Since the tradeshow, Brizi and Canon planned how both companies can help elevate the future of imaging technology and business beyond sports and entertainment. The partnership with Brizi marks a new chapter in innovation for Canon with the goal to continue to identify startups and technology partners for collaboration in the imaging industry. Canon and Brizi plan to bring a showcase of the BriziCam platform to this year’s CES® at booth #16206, offering show attendees the opportunity to immerse themselves in a stunning view of the Grand Canyon. This is made possible through their integration of Canon technology. To further drive the conversation about collaboration and open innovation with startups and other corporations, Canon will also host a panel discussion, “A New Era of Collaboration, Powered by Canon” on Thursday, January 10 at 1:00 pm in Eureka Park with panelists from Brizi, EA and Tome Software, moderated by co-founder of ID8 Innovation Mara Lewis. Please visit Canon at the 2019 CES Show at Booth #16206 in the Central Hall and #50653 in Eureka Park and follow Canon throughout the show on Instagram at @CanonUSA and Twitter at @CanonUSAimaging. Use #CanonCES to join the conversation and visit our website at www.usa.canon.com.